Roulette is a common game in every casinos of the world. You don't need to be skilled to play the game you can play the game without knowing about the game so much. All you have to learn about the game is how to bet on the game and how to play the game. 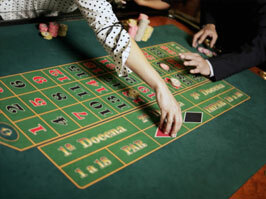 Learning how to play roulette is really easy for the game but learning hot to bet is lot more critical than the game. If you know well about the betting then you can easily minimize your losing amount and maximize you winning amount. So, first you must have a clear knowledge about betting on the roulette table. The usual process ii betting on the numbers but you must know where will you put the chips, betting on more than one number is legal or not and what will be the ratio for each bet. If you know these questions and answers well then you can bet on roulette easily. Inside bets have higher payouts and these bets based on the numbers of each slot of roulette table. You can bet on any number you want including the zeros and the payout is 35:1 for this bet. You can bet on 2 numbers and the payout will be 17:1 for this bet. You can bet on 3 numbers of a horizontal row and the pay out will be 11:1 for this bet. You can bet on any 4 numbers and the payout will be 8:1 for this bet. You can bet on 6 numbers of 2 adjoining rows and the payout will be 5:1 for this bet. You can bet on the 0, 00, 1, 2, 3 but this bet has a little or no change to win so it will be better if you avoid this bet and the payout for this bet is 6:1.